Voltage amplifier is used to strengthen the input voltage. Voltage gain is the ratio of output voltage with input voltage. Where can we set the gain. Did this voltage amplifier applications? Alredy understand , Voltage amplifier can be used before the filter and power amplifier between the input signal and speaker. Remember again telecommunication engineering materials where the voltage amplifier is represented as a repeater in the process of data transmission. The first thing to be done before designing the amplifier voltage gain is desired is to determine because the voltage gain is the main purpose of the voltage amplifier. By the way, the voltage amplifier is an amplifier Class A. Then determine the base sequence that is used along with transistors. In the amplifier voltage, output current (collector) is not so necessary so that the collector current labored as small as possible. All to save energy consumed. So there is no special requirement on the transistor voltage amplifier, where the collector current is set at 1% of the maximum collector current. Beta transistors that are not so influential on the quality of the amplifier (let alone use a voltage divider circuit which is relatively stable against changes in beta). The values ​​of other components can be searched with the existing formula. What about power amplifier? Aims to increase the power amplifier output signal power. In the course of this analog electronics, applied as a power amplifier on the speakers. At this power amplifier, the output voltage is set equal to the dc input voltage. While the current value of that changed. Does anyone know why the power amplifier, the voltage is fixed while the current is changed. I think changing the output flow is easier than changing the voltage output. And voltage range that can be applied is much smaller than the current range. Therefore it can be, the required current is very large so that in choosing a transistor must be adapted to current needs. If very large currents are needed at all, then it can be used Darlington transistor circuit. 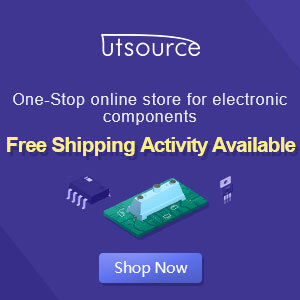 When I buy a transistor which has a large maximum collector current (about 1.5 A) appeared to form transistors is different from that so far I bought. At the center hole is used to heat sink. Heat sinks are used for fast component is not hot. By mounting the heat sink transistor then expand the surface so that heat more quickly thrown into the air. The price is relatively the same as a small power transistor. Btw, the actual power amplifier is a class B amplifier Class B amplifier is very efficient because the transistor will be active only when no signal input. Class B amplifier circuit consists of two identical transistors where each transistor is alternately brought in each half cycle. 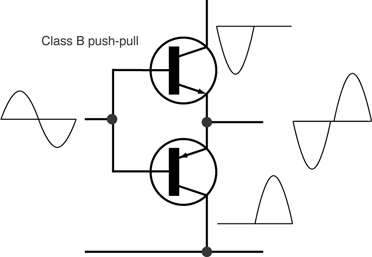 But there are drawbacks as well, the base emitter such as a diode that will be active when it has reached the forward bias voltage. So when the turn on off is not the same. Cause distortion of cross-over events. Form the output signal distortion due to cross-over is not expected that it needs considerable effort to overcome them. The solution is to arrange for the active transistor so that the need for constant base current (very small) even when it brought the transistor is not named as a class AB amplifier circuit.